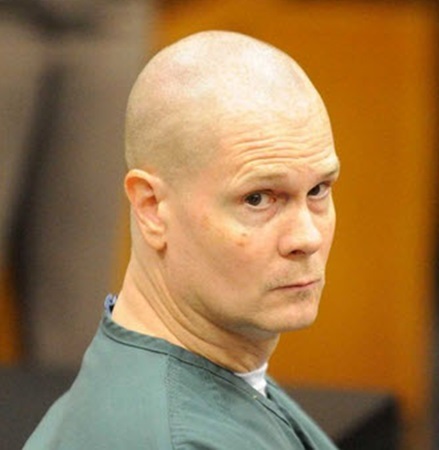 The story of Richard “White Boy Rick” Wershe, Jr. is an epic tale, sprawling and complex. It is a challenge to keep the story straight because there are so many players, so many events. It is a challenge to tell you about it. It is much more than a story about a white teenage dope dealer in the black underworld. It is every bit as much a tale about police criminality, political corruption and what appears to be a decades-long vendetta, a dark and chilling conspiracy within the criminal justice system against a teenager who dared to help the FBI put politically-connected dope dealers and corrupt cops in jail. It appears to be an organized violation of one man’s civil rights over his entire adult life. There are dozens of important events and hundreds of characters in this story. Two key episodes were Wershe’s 1988 drug trial and his 2003 parole hearing. This lengthy blog post touches on both. Those bothered by how long it takes to read this should remember Rick Wershe has lived with all of this every day, 24/7, in an 8 X 12 prison cell for the past 27 years. A fierce, fast-moving battle of legal briefs is now being fought in the Michigan Court of Appeals over the re-sentencing of Richard J. Wershe, Jr. who is serving a life prison term for dealing drugs. Hitman murderers, serial rapists and habitual child molesters have gone to prison and have been let out of prison by the Michigan Parole Board during the nearly three decades Rick Wershe has been kept behind bars. 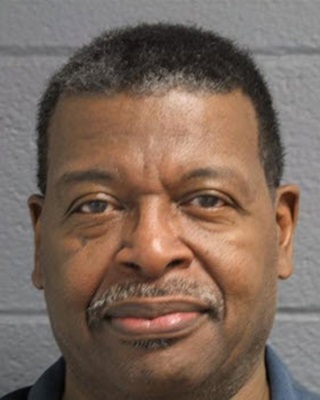 Others convicted of selling far more dope than Wershe ever saw in his life have been in and out of Michigan prisons during his time behind bars. Many Detroit news organizations have been wrong in their reporting dating back to when Wershe was convicted. Last Friday, for instance, two Detroit TV stations reported a Court of Appeals-ordered postponement of Wershe’s re-sentencing was a setback for Wershe. That is wrong. All parties agreed to the delay and Wershe’s defense team breathed a sigh of relief that the fast-moving court battle had slowed to give them time to hone their legal briefs. The entire basis for demanding that Wershe remain in prison is the claim that his drug crimes were so vast, so deadly, that he poses a menace to society. If that claim can be shown to be false, there is no evidentiary basis, no factual basis for keeping Wershe in prison one more day. There are thousands of pages of documents related to Richard J. Wershe Jr., also known as White Boy Rick, in the files of law enforcement and the criminal justice system. The most damning by far is a letter from former Wayne County, Michigan prosecutor Mike Duggan to the Michigan Parole Board. Duggan is now the Mayor of the City of Detroit. In that letter Duggan urges the Parole Board to keep Wershe in prison until he dies. 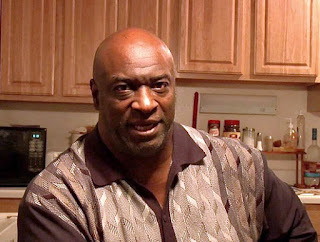 The letter is dated February 17, 2003, several weeks ahead of Wershe’s one and only parole hearing since he was sentenced to mandatory life in 1988 for possession of eight kilos of cocaine. The law was later changed to parolable life. The three-page letter purportedly written by Duggan contains serious allegations in stunningly harsh language about the crimes and misdeeds of Richard J. Wershe, Jr. The use of the word “purportedly” will be become clear later in this blog post. In Michigan politics and in its courts, the name Mike Duggan has marquee value. He made a name for himself as the number two man to Ed McNamara, the late Wayne County Executive. McNamara was an old-school machine politics boss and he taught Duggan how to use the levers of power. In 2000 Duggan was elected Wayne County prosecutor. 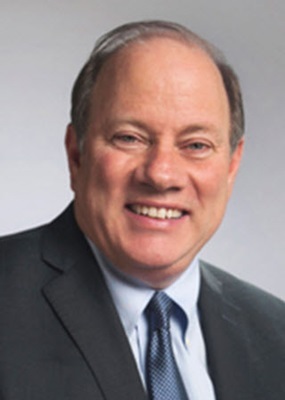 Duggan’s reputation as a politician of action got him elected in 2013 as Detroit’s first white mayor since Roman Gribbs in the 1970s. Then, as now, the Duggan letter to the Parole Board about Wershe carried a lot of weight. When the letter was written, Duggan was the prosecutor of the most populous county in Michigan, the county dominated by the City of Detroit. Today, he’s the Mayor of the City of Detroit, always a powerful office in Michigan politics. When Rick Wershe’s attorney, Ralph Musilli, filed a lawsuit in federal court in Grand Rapids claiming the Parole Board violated Wershe’s Eighth Amendment rights against cruel and unusual punishment, the Michigan Attorney General’s office filed a response brief in behalf of the State Parole Board. That brief only had a few attachments or exhibits even though there are 11 pounds of documents in the Department of Corrections Wershe file. (I have copies of all 11 pounds.) One of the exhibits from the Wershe file selected by the Michigan Attorney General to persuade the federal court judge that Wershe should remain in prison was the Duggan letter. The state attorney general’s office obviously believes the name Mike Duggan, ex-Prosecutor-now-Mayor of the City of Detroit, has marquee value even in a federal court on the western side of the state. To fully understand the saga of Richard J. Wershe, Jr., I decided I needed to learn about the details of the incendiary, over-the-top allegations contained in the Duggan/Wershe letter. I filed a Freedom of Information Act (FOIA) request with the Wayne County Prosecutor’s office. My FOIA request cited the main Duggan letter allegations against Wershe, paragraph by paragraph, and requested copies of all law enforcement/prosecution documentation supporting the claims and assertions in the Duggan letter. 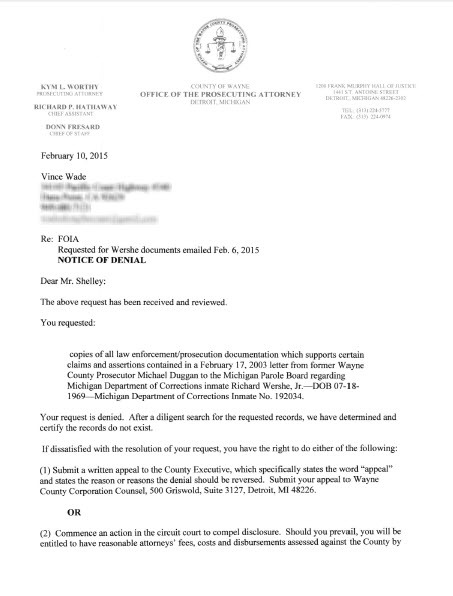 Wayne County Prosecutor's Letter Denying FOIA request because "the records do not exist." My FOIA request was denied—because there is no supporting documentation. Current Wayne County Prosecutor Worthy is fighting a judge’s decision that Wershe should be re-sentenced, even though her office doesn’t have any documentation to support claims that he shouldn’t be released because he poses a danger to the community. Let’s get back to the Duggan letter. I’ll begin with a portion of the letter’s first paragraph, which summarizes Duggan’s opinion of Wershe. The Duggan letter contains occasional use of bold text in the first paragraph as reproduced below. The second paragraph of Duggan’s letter launches in to allegations against Wershe. I’ve broken it down in a three-part format. To follow are the key allegations about Richard J. Wershe, Jr. from the Duggan letter to the Parole Board, followed by my FOIA request to the Wayne County Prosecutor’s Office in italics, followed by the response from the office of current prosecutor Kym Worthy in bold text. The reason for the FOIA denial is repeated after each allegation in the Duggan letter for emphasis and is not a feature of the FOIA denial. “Wershe had 17.5 pounds or approximately eight kilos of cocaine that was taken to the next door neighbor’s house by David Golley, and placed under their porch.” —Duggan 2003 letter to the Michigan Parole Board regarding parole for Richard J. Wershe, Jr.
“In response to this Freedom of Information Act request, please provide any police reports, witness statements, police lab fingerprint reports or any other documentation that is the basis for Prosecutor Duggan’s assertion that Mr. Wershe “had” the cocaine Mr. Golley allegedly placed under a porch.” —Vince Wade Freedom of Information Act request. “From the records, it appears that Wershe’s gang and the police were contemporaneously looking for the cocaine up and down the street, both trying to find it first.” —Duggan 2003 letter to the Michigan Parole Board regarding parole for Richard J. Wershe, Jr. 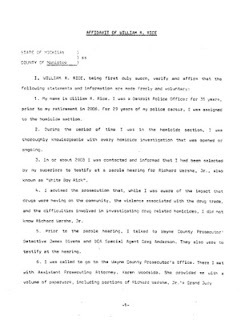 In response to this Freedom of Information Act request, please provide copies of “the records” referenced in Mr. Duggan’s letter in which he states “it appears” that Wershe’s “gang” and the police were contemporaneously looking for the cocaine up and down the street…” —Vince Wade Freedom of Information Act request. In addition, in response to this Freedom of Information Act request please provide any police reports or any other documentation that is the basis for Prosecutor Duggan’s assertion about “Wershe’s gang.” As part of this response please provide documentation regarding the names or any other identifying information regarding Mr. Wershe’s alleged “gang.” —Vince Wade Freedom of Information Act request. 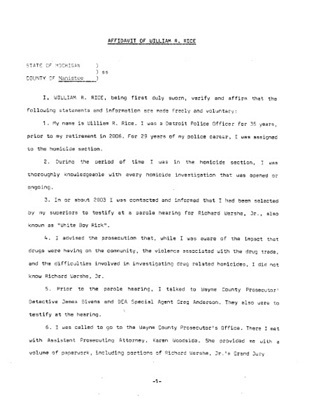 “There was a joint task force assigned to this case, tremendous public taxpayer-funded resources and personnel were expended to stop this ruthless drug dealer.” —Duggan 2003 letter to the Michigan Parole Board regarding parole for Richard J. Wershe, Jr.
“In response to this Freedom of Information Act request, please provide any and all documentation which supports Prosecutor Duggan’s claim that a ‘task force’ was assigned to the Richard Wershe, Jr. cocaine case of 1987 which was the basis for his subsequent conviction or any other documentation that is the basis for Mr. Duggan’s assertion that Mr. Wershe was the target of a ‘task force’ investigation.” —Vince Wade Freedom of Information Act request. “Several of Wershe’s gang members were found dead.” —Duggan letter to the Michigan Parole Board regarding parole for Richard J. Wershe, Jr.
“In response to this Freedom of Information Act request, please provide any and all documentation which supports Prosecutor Duggan’s claim that Wershe had a “gang” and that several “were found dead.” Please identify the deceased “gang” members that are the basis for former Prosecutor Duggan’s assertion.” —Vince Wade Freedom of Information Act request. “Witnesses in inmate Wershe’s case just disappeared.” —Duggan 2003 letter to the Michigan Parole Board regarding parole for Richard J. Wershe, Jr.
“In response to this Freedom of Information Act request, please provide any and all documentation which supports Prosecutor Duggan’s claim that witnesses in the Wershe 1987 cocaine case ‘just disappeared.’” —Vince Wade Freedom of Information Act request. “Inmate Wershe is precisely the kind of drug dealer, gang leader, notorious violent kingpin that the over 650 g of controlled-substances-lifer law was written for, and meant to punish.” —Duggan 2003 letter to the Michigan Parole Board regarding parole for Richard J. Wershe, Jr.
"In response to this Freedom of Information Act request, please provide any and all law enforcement/prosecution documentation which supports Prosecutor Duggan’s assertion that Richard Wershe Jr. was a 'gang leader' and 'violent kingpin. '” —Vince Wade Freedom of Information Act request. “Wershe’s violent collateral crimes and the sheer volume of controlled substances that were introduced to the City of Detroit confirm that Wershe is a serious danger to the People of the City of Detroit, and all of Southeastern Michigan, in particular.” —Duggan 2003 letter to the Michigan Parole Board regarding parole for Richard J. Wershe, Jr.
"In response to this Freedom of Information Act request, please provide any and all documentation which supports Prosecutor Duggan’s assertion that Richard Wershe Jr. was involved in 'violent collateral crimes.' Please cite specific examples of Wershe’s 'violent collateral crimes. '” —Vince Wade Freedom of Information Act request. “Wershe profited from the countless drug sales that his gang made, and the criminal enterprise that he built.” —Duggan 2003 letter to the Michigan Parole Board regarding parole for Richard J. Wershe, Jr.
"In response to this Freedom of Information Act request, please provide documentation that Mr. Wershe was ever charged with a criminal conspiracy and/or operating a criminal enterprise as implied by former Prosecutor Duggan in his letter wherein he refers to Wershe’s 'gang' and 'criminal enterprise. '” —Vince Wade Freedom of Information Act request. “His family background does not suggest a likelihood of reform. The (Richard Wershe Jr.’s) father was believed to be an electronics technician for the Mafia.” —Duggan 2003 letter to the Michigan Parole Board regarding parole for Richard J. Wershe, Jr.
"In response to this Freedom of Information Act request, please provide documentation and specifics that are the basis for stating 'the father was believed' to be a 'technician for the Mafia. '” —Vince Wade Freedom of Information Act request. As reported in last week’s blog post, the animus of the Wayne County Prosecutor’s Office toward Richard J. Wershe, Jr. extends over the tenure of three prosecutors, beginning with the late John O’Hair who wanted Wershe’s cooperation in prosecuting a corrupt Detroit Police narcotics sergeant. Wershe had been bribing the sergeant to prevent raids on his stash houses for drugs and cash. One of O’Hair’s assistant prosecutors met with Wershe in prison and told him the prosecutor’s office wanted him to fully cooperate in the case against the sergeant but they offered Wershe nothing in return on his life prison sentence. Wershe told him to buzz off and O’Hair was livid. In 2003, at Wershe’s one and only parole hearing the Wayne County Prosecutor's Office—Mike Duggan was prosecutor at that time—mounted a frantic effort to keep Wershe in jail. The prosecutor’s presentation to the parole board was long on innuendo and implied criminality but short on factual evidence. The few police investigative files given to the Parole Board do not come close to painting a picture of a major drug trafficker. The usual supporting police paper trail of a major conspiracy and of a coordinating key conspirator wasn’t there. It was a sign of things to come. It defies belief and common sense to think the prosecutor’s office would matter-of-factly purge the archives of any real evidence they had against this inmate they made out to be a notch or two above Satan. If the Wayne County Prosecutor wanted to keep this guy in prison until he dies, common sense would tell us they would keep their evidence against him indefinitely and not purge it. Wershe’s work as a confidential informant in Detroit’s drug underworld gained him two politically powerful enemies: Detroit Mayor Coleman Young and police executive and later city council president Gil Hill. 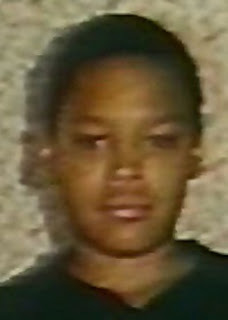 Wershe helped the FBI convict Willie Volsan, the mayor's brother-in-law and while he was an undercover informant he tipped the FBI that the Curry Brothers dope gang had inadvertently killed a 13-year old boy named Damion Lucas in a drive-by shooting. Damion Lucas, 13, killed in a drive-by shooting by a member of the Curry Brothers drug gang. 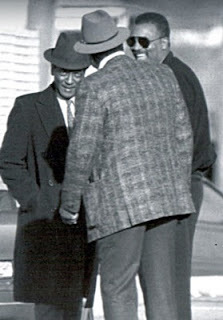 The FBI suspected Detroit Police Homicide Inspector Gil Hill was bribed by Johnny Curry to divert the investgation away from the Curry gang. Wershe also advised the FBI he was riding in Johnny Curry's car when Curry took a call on his car phone (cell phones weren't in use in 1985) from Gil Hill. Curry put the phone on speaker mode and Wershe says he heard Hill reassure Curry that he would take care of the murder investigation and Curry shouldn't worry. In fact, the homicide investigation tried to frame an innocent man named LaKeas Davis. Charges against Davis were eventually dropped. The Damion Lucas murder has never been prosecuted even though the Wayne County Prosecutor's office knows who killed Damion Lucas. 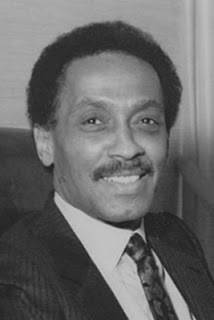 From the time of the Damion Lucas murder forward, the FBI considered Gil Hill to be a prime target for investigation of obstruction of justice and police corruption amid allegations Curry had paid him $10,000 to draw the investigation of the little boy's murder away from the Curry gang. Hill has never been charged and he has repeatedly denied the accusations. Wershe aided the FBI in corruption and drug investigations linked to both Hill and Young. Wershe believes friends and allies of Young and Hill are behind a vendetta to this day to keep him in prison no matter what. It is a known and provable fact that Rick Wershe continued to help the FBI prosecute drug dealers and police corruption—from prison. One of those retired FBI agents is Gregg Schwarz who worked with Wershe as an informant for a time. Schwarz has taken on the role of mentor and emotional lifeline for Wershe. Schwarz has talked with him by phone nearly every week for 27 years. Retired agent Schwarz will tell anyone who will listen, “Rick Wershe never had a gang, he never operated crack houses and he was never charged with a violent crime.” Schwarz is among those who suspect there is a conspiracy to keep Wershe behind bars. 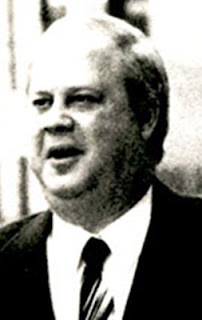 Wershe was never charged by any law enforcement entity with conspiracy, which is a fundamental legal element when prosecuting a drug ring, he was never charged with racketeering and he was never charged with operating a Continuing Criminal Enterprise, the so-called “kingpin” statute in federal law. Yet the Michigan Parole Board refuses to grant him parole. This raises a question: are members of the Michigan Parole Board under the thumb of powerful people in Detroit who want Wershe to die in prison? Are they part of a conspiracy to deny Wershe his constitutional rights? How else to explain why the Board never questioned a series of amazing conflicts in law enforcement testimony at Wershe’s only parole hearing in 2003? There were three FBI agents testifying for his parole, there were two DEA agents testifying against his parole. Yet no one on the Parole Board asked why agents from two federal law enforcement agencies fighting the “war on drugs” were on opposite sides of parole for Richard J. Wershe, Jr.
White Boy Rick is not “innocent.” He’s not a choir boy. It’s true he got involved in the drug trade at the wholesale level, but his life sentence is totally out of sync with similar drug sentences at the federal level and state level in Michigan. After all these years, the only reasonable conclusion is the fight by the Wayne County Prosecutor to keep him in prison is part of a decades-long vendetta against a federal informant who helped bring down corruption in the criminal justice system of Detroit/Wayne County. Significantly, not one narc from the Detroit Police Department testified, yet they were the ones who arrested him in the case that was before the parole board. This was never questioned by the Parole Board or the reporters present. Wershe’s former defense attorney, the late William E. Bufalino II testified at the parole hearing that he got a personal warning from Detroit Mayor Coleman Young about defending Rick Wershe. “I was personally told by Coleman Young that this...’stay out of this. This is bigger than you think it is,’" Bufalino testified. Bufalino’s explosive testimony didn’t stop there. "(But) the mayor's office was bad, the prosecutor's office was bad," Bufalino told the Parole Board panel. These quotes are from an official transcript of the Wershe parole hearing. The mayor’s office was “bad”? The prosecutor’s office was “bad”? What did he mean by that? This was a veteran Detroit criminal defense attorney making these charges. Corruption allegations swirled around the administration of Coleman Young for years. But what, specifically, was Bufalino talking about? What was the context of the warning from Coleman Young that ‘this is bigger than you think it is’? We will never know. Bufalino also testified the prosecutor’s office was “bad.” Did he mean there was corruption in the prosecutor’s office? If so, how did it impact Rick Wershe? No one on the Parole Board, none of the reporters, asked him to explain what he meant. We can’t ask him now. Bufalino passed away. No one followed up on a dizzying array of loose ends in that hearing. Former Detroit FBI agent Mike Castro, now retired, worked undercover in a sting operation that resulted in a dozen cop convictions. Castro told me he owes his life to Rick because Wershe backed up his cover story at a point in the investigation where the federal agent’s life was on the line. From prison, Wershe reassured wary Detroit dope dealers and their corrupt cop friends that Castro, using the name Mike Diaz, was the real deal, one of Rick’s “connects” from Miami. Wershe convinced the bad guys that the undercover FBI agent could be trusted. Rick Wershe didn’t have to do that, but he did. It can be argued that Rick Wershe should be given a good citizenship commendation, rather than have to live through one more day of slander against his name, one more day of mendacity in the criminal justice system aided and abetted by lazy and/or incompetent members of the news media who persist in describing him as a former drug lord and kingpin. It’s a lie they routinely reported and continue to report as fact without any evidence. To this day some news organizations persist in describing Wershe as a drug-dealer-turned-informant. This is totally false and exactly backwards. Rick Wershe was recruited at age 14 and trained in the ways of the dope trade by members of the Detroit federal drug task force. He didn’t get in the dope business until law enforcement put him there. FBI agents weren’t the only ones who used Rick. Wershe says retired Detroit Police narc Billy Jasper, who was assigned to the federal drug task force, “burned up my pager” having him make drug buys in his role as a confidential informant. Rick’s misadventure in the drug world happened by happenstance. Rick Wershe knew and was trusted by the Curry Brothers drug organization because to them he was just Ricky from the ‘hood. Around age 16 Wershe tried to become a “weight man”, a narcotics wholesaler, after law enforcement suddenly abandoned him when they got what they needed from him in the investigation and prosecution of the Curry Brothers drug gang. Wershe had dropped out of school to play the role the task force asked him to play and paid him to play. Wershe never became a drug addict but he admits he became addicted to the glitz and bling and cash. He became addicted to the fast cars, fast women and fast life of the drug underworld. They let this kid they drew in to the drug underworld confront the criminal justice system all alone. Rather than admit what they had done to a juvenile, the Detroit federal drug task force let this young man be sentenced to life in prison. The Wayne County prosecutor is fighting and fighting hard to keep him there even though they admit they don’t have any evidence to support the myth that a 16-17 year-old white kid named Rick Wershe somehow ruled the deadly black drug trade in Detroit in the late 80s. Nate “Boone” Craft, a convicted and paroled hit man from that era knows the true story of the streets in those days. Craft was a member of the Best Friends murder-for-hire crew. He said drug execution murders on the streets of Detroit in the late 80s eventually tapered off for a very simple reason. Recently Craft told me the White Boy Rick myth is just that. A lie made up by law enforcement. Craft laughs at the notion that this white kid with a peach-fuzz moustache was giving orders to black adult dope slingers. “He ain’t run us,” Craft said. “He wasn’t no top dog.” Craft says, however, he and his associates in the drug underworld were impressed by the connections Wershe had made in Florida in his short-lived effort to become a “weight man.” He coulda been a contender. He coulda been somebody. But he got busted. Can we believe Nate Craft? It seems so. He has support for what he says from a lawyer who knows a lot about Detroit’s drug trade. Longtime Detroit criminal defense attorney Steve Fishman agrees Rick Wershe was no kingpin or drug lord. Fishman was involved as a defense attorney in most of the major Detroit drug trials of the era. He told me Wershe’s name never came up as a figure in any of those cases in any context. 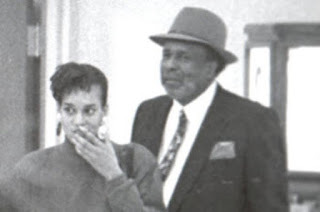 In her 2003 testimony before the Parole Board Assistant Wayne County Prosecutor Karen Woodside noted at the end of Wershe’s drug trial the courtroom was filled on sentencing day with young black men decked out in bling; fancy clothes and lots of flashy jewelry. “’As (trial) Judge Jackson wondered aloud at the sentencing when he looked at the room full of jewelry bedecked youths, he said one can only wonder if they were here out of concern or to find out when and how they’d fill the void,’” Woodside testified. It sounds pretty damning until you talk with Nate Craft about that day. Craft says he and a bunch of the dope slingers from the ‘hood were paid by Detroit narcs to show up at court to “demonstrate” against the sentencing of White Boy Rick. “We was paid to come down to protest about Rick,” Craft told me. “They had us wear bling. They wanted us to pack the courtroom.” Some of the street guys weren’t paid outright, Craft says. Some were lured to the court with a promise the narcs would go easy on drug raids for a while. It was a theatrical stunt orchestrated by the police to make it look like Richard J. Wershe, Jr. was the pied piper of Detroit’s drug underworld. Wershe was in prison 15 years before he finally had a parole hearing. His parole board hearing is filled with intriguing elements never reported in the media. For example, retired FBI agent Herman Groman says he had to have Wershe’s attorney subpoena him to testify because higher-ups in the Bureau in Detroit didn’t want him to get involved in such a controversial hearing. The FBI was only too happy to use Wershe as a juvenile informant, but when he needed help, FBI executives turned their backs. Groman had been Wershe’s primary “handler.” Wershe probably had more official investigative contact with Groman than any other agent. Groman, who had been transferred to the FBI Las Vegas office by then, had to pay his own way back to Detroit to appear as a witness. Knowing his bosses were not pleased, Groman was careful in what he said in his testimony. With the exception of a few retired FBI agents with a sense of justice, federal law enforcement has remained silent about Rick Wershe to this day. They hide behind “no comment” instead of doing what they ought to do, which is launch a criminal investigation of the ongoing violation of Rick Wershe’s civil rights by Detroit/Wayne County law enforcement and the Michigan Parole Board. This is public corruption of a different sort. It is a conscious, deliberate and sustained effort within the criminal justice system to destroy a man who helped the federal government prosecute drug dealers and corrupt cops. “Rick Wershe is arguably the most productive informant in the history of the Detroit Office of the FBI,” says retired Detroit FBI agent John Anthony who was the in-house legal adviser during the Wershe era. In a very real sense, the Detroit/Wayne County criminal justice system vendetta against Rick Wershe is a vendetta against the Justice Department for investigating and prosecuting public corruption. The extraordinary effort to keep Wershe in prison until he dies is a warning to others who would dare to help the FBI nail corrupt cops, prosecutors and politicians who are cozy with dope dealers with deep pockets. A federal civil rights investigation of the Wayne County Prosecutor, the entire Michigan Parole Board, some past Detroit police officers and several past members of federal law enforcement in Detroit would serve as a warning to police and prosecutors everywhere not to retaliate against federal informants unless they want to risk going to prison themselves. When it comes to the Michigan Parole Board, which is responsible to no one, the feds might need to open a special office in Lansing to investigate civil rights abuses in the issuance or denials of other paroles. Current members of the U.S. Justice Department first need to admit to themselves that their agencies are not blameless in all of this. Federal prosecutors used Rick Wershe, just as their investigators had done. One Assistant United States Attorney (AUSA) promised prison inmate Wershe he would go “balls to the wall” to help him with his state case if Rick would just testify before a federal grand jury about the so-called Best Friends murder-for-hire gang. Rick kept his end of the agreement. The assistant United States Attorney did not keep his end of the agreement. He broke his promise to Wershe apparently without a second thought. The shame of federal law enforcement in Detroit in the treatment of Richard J. Wershe, Jr. continues to this day. A thorough federal civil rights investigation would have to include the actions of a couple of DEA agents who testified against Rick Wershe’s release at his 2003 parole hearing. Why would two DEA agents testify against Wershe after two other DEA agents had visited Wershe in a federal prison in Arizona a decade earlier and pleaded with him to come back to Detroit to testify before a federal grand jury investigating the Best Friends murder-for-hire gang? Wershe cooperated with the DEA and testified before a federal grand jury. His reward was the testimony of two other DEA agents who tried to help bury him for life at his hearing on whether he should be released on parole. If federal investigators explore the corrupt vendetta against one of their recruited informants they can start by quizzing former Detroit U.S. Attorney Jeffrey Collins who was the head of the office at the time of Wershe’s 2003 parole hearing. They should ask him how the Wayne County Prosecutor’s Office—Mike Duggan was the prosecutor at the time—came to have a copy of Wershe’s sealed grand jury testimony about the Best Friends murder-for-hire organization. That testimony remains under seal to this day. I verified this with U.S. District Court judge Avern Cohn, the federal judge on the Best Friends case. They might also want to know why Collins sent the Michigan Parole Board a letter overriding and rescinding an earlier letter from one of his assistants, Lynn Helland, recommending parole for Wershe due to his extensive cooperation with law enforcement. They might ask Collins to produce any other letter he wrote to the Michigan Parole Board regarding any other state inmate. The media might ask him the same question. The Collins intervention in the Wershe parole might make sense if he had been one of their prosecution targets. He wasn’t. The U.S. Justice Department never charged Wershe, who was their informant, with anything. He was never named as a co-conspirator in any federal indictment. He was never named as an unindicted co-conspirator. He was never charged with criminal conspiracy, racketeering or operating a Continuing Criminal Enterprise, the so-called “kingpin” statute in federal law. In fact, Rick Wershe was never named as a figure in any capacity in any federal case. So why would the U.S. attorney, a former defense attorney for some of Detroit’s powerful dope dealers, oppose state parole for a man who had helped the government put dope dealers and corrupt cops in prison? Federal civil rights investigators might want to connect some dots. Early in his law career Collins worked for the late Ed Bell, who was Wershe’s defense attorney in his 1987 drug case. Some wonder if Bell didn’t deliberately sabotage Wershe’s defense in order to ensure that Wershe went to jail for life for informing on Bell’s crooked friends in the Detroit political and law enforcement power structure. Bell was an ally of Detroit Mayor Coleman Young. One of Bell’s law partners at the time was Sam Gardner who later became the Chief Assistant Prosecutor—under Mike Duggan. Gardner assisted Bell in Rick Wershe's 1988 drug case. Gardner was the Number Two man in the prosecutor’s office at the time of Wershe’s 2003 parole hearing. Among those suspicious of Bell’s handling of the Wershe case is Wershe’s current defense lawyer, Ralph Musilli. He notes Wershe’s initial attorney, the late William E. Bufalino II had filed a motion to suppress the evidence because there were no Rick Wershe fingerprints on the cocaine or the box it was in. And it was found under a porch in Wershe’s neighborhood well after he had been arrested. The appeals argument would be, how could Wershe “possess” something that didn’t have his fingerprints on it? Musilli argues the shaky prosecution connection of Wershe to the seized drugs would be a strong appeal issue in the event of a conviction. When Wershe pushed Bufalino aside and hired Ed Bell, one of the first things Bell did was withdraw Bufalino’s motion to suppress the evidence. When Wershe was convicted, he had no appeal issue after Bell withdrew the Bufalino suppression motion. "It was Bell and Gardner. They guaranteed him that he would walk. They pulled a motion, a dispositive motion on a search and seizure issue regarding this case. They pulled the motion. They hung this boy out to dry." Wershe had dropped Bufalino and hired Bell to defend him at the urging of Cathy Volsan Curry, the favorite niece of the late Coleman Young, the longtime powerful mayor of the City of Detroit. When her husband went to jail after he was convicted in the FBI investigation where Wershe was the confidential informant, Cathy Volsan Curry boldly approached Wershe, who was much younger, and suggested they have a fling. They did. (See this Informant America blog post: “White Boy Rick: A Child of Coleman Young’s Detroit”) Rick Wershe and Cathy Volsan Curry were having their torrid affair at the time he was arrested. Cathy Volsan Curry’s father was the late Willie Volsan a longtime racketeer in Detroit’s black community, a major drug dealer and the brother-in-law of Detroit Mayor Coleman Young. Willie Volsan was reputed to have excellent connections in the Detroit Police Department and many believed it was due to his related-by-marriage ties to Coleman Young. Volsan was eventually caught and prosecuted in the FBI sting of corrupt police officers mentioned previously. It was Rick Wershe who enabled the FBI sting operation that sent Willie Volsan to jail. 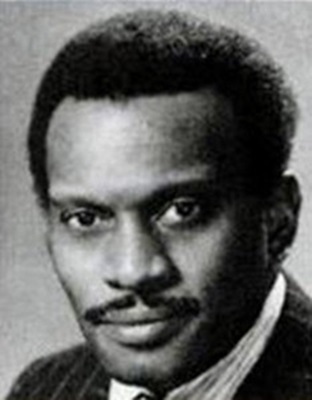 The FBI tried to catch Gil Hill in their sting, too. 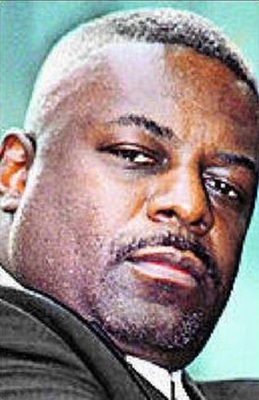 Hill had a business relationship with Willie Volsan and Willie introduced Hill to undercover FBI agent Mike Castro who was posing as a Miami cocaine baron who needed police protection moving drugs and cash through Detroit. The street-savvy Hill backed away before the FBI could collect enough evidence to indict him. Willie Volsan’s brother-in-law, Mayor Young, was still in office when Willie got busted thanks to White Boy Rick. This snitching white kid had slept with his niece and helped the FBI, which Young despised, send his sister’s husband to prison. We can only speculate about what the late Mayor Young may have said about White Boy Rick to his fanatically loyal cronies and pals in the Detroit black political and law enforcement establishment. If the feds launch a civil rights investigation they need to visit Oaks Correctional Facility in Manistee, Michigan and interview an inmate named William Rice. 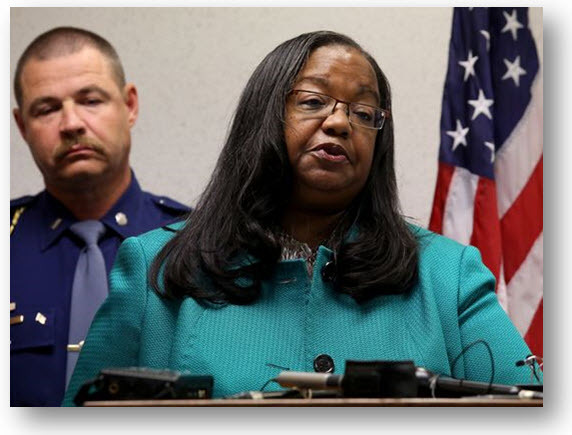 Rice is the former head of the Detroit Police Homicide Section. He was Detroit’s top homicide cop for 20 years. He testified against parole for Rick Wershe at that 2003 hearing. Ironically, Rice is now in prison. He was convicted in a mortgage fraud case and he was charged with selling prescription pills and marijuana. Here’s more irony: Rice is in the same prison as Rick Wershe. Rick Wershe told me he deliberately confronted the ex-homicide cop one day at a prison lunch table by sitting across from Rice and staring at him. “Do I know you?” Wershe recalls Rice asking. “You are one of the reasons I’m still in here,” Wershe replied across the lunch table. Rice seemed stunned as Wershe told him the story. Rice told Wershe he was pressured by higher-ups in the Police Department to testify against Wershe even though he had no idea who Richard J. Wershe, Jr. was. After that lunch table encounter Bill Rice decided he would belatedly try to help Wershe, his fellow inmate. He prepared a sworn affidavit in which he said that he was ordered to testify against Wershe at his parole hearing even though Rice had never encountered Wershe’s name in any murder investigations. Equally important is Rice’s assertion that he was sent to the Wayne County Prosecutor’s Office to review some documents in preparation for his testimony at the Rick Wershe parole hearing. Rice has the unique perspective of being Detroit’s top homicide cop and now he’s on the other side, in prison. He knows the system from both sides. There’s more. Rice says he was puzzled about being told to testify against Richard Wershe, Jr.
Rice didn’t leave it there. Why the hell would Jeffrey Collins, the U.S. Attorney, orchestrate testimony against Wershe, a state prisoner, who had been a paid informant for the federal government and who had done a good job helping the U.S. attorney’s office prosecute drug traffickers and corrupt police officers? And why would Gil Hill know something like that unless he was in on the planning, too? Remember what was said about Collins earlier. 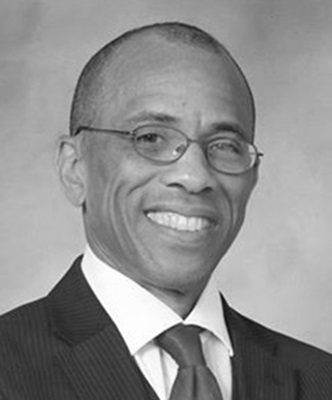 Collins learned the criminal defense business working for Ed Bell. Milton "Butch" Jones, the notorious leader of Young Boys, Incorporated, an infamous drug gang in Detroit, wrote a self-adoring, self-published autobiography called, "Y.B.I.-The Autobiography of Butch Jones." Jones ends the book with this line: "Hell, somebody had to take over this city. Why not me?" At the end of the book, in the acknowledgements, he gives a shout-out to Jeffrey Collins. Milton "Butch" Jones, leader of the drug gang Young Boys, Incorporated, wrote a self-published autobiography which includes in the acknowledgements his appreciation for the work of attorney Jeffrey Collins who was working for the Ed Bell law firm when Jones knew him. 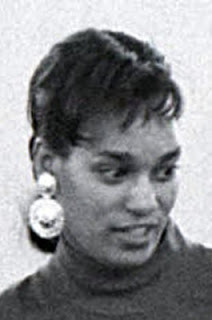 Collins later became the U.S. Attorney for Detroit and opposed the parole of Rick Wershe, Jr. even though it was a state matter. Bell’s law partner was the late Sam Gardner who later became the Chief Assistant Wayne County Prosecutor under Mike Duggan. Gardner held that position at the time of the Wershe parole hearing. Did I mention Gardner had “assisted” Bell in defending Wershe in 1987-88? Now, he was the Chief Assistant Prosecutor as the Wayne County Prosecutor’s Office tried desperately to keep Wershe in prison. And they were desperate. Retired FBI agent John Anthony, mentioned previously, was the legal advisor to the Detroit office at the time of the Wershe parole hearing. Anthony remembers getting a “frantic” phone call a day or two before the parole hearing from Detroit Police Commander Dennis Richardson, now retired. Anthony told me Richardson pleaded to get his hands on material that could be used against Wershe at the parole hearing. Anthony wasn’t about to turn over FBI investigative files. He gave Richardson the FBI’s newspaper clipping file about White Boy Rick Wershe. Those newspaper clippings were submitted at the parole hearing by assistant Wayne County Prosecutor Karen Woodside as part of the “evidence” against Richard J. Wershe, Jr. They threw anything they could find at the parole hearing wall, hoping it would stick. Maybe there are many, many dots to be connected in the tangled web of the vendetta to keep Rick Wershe in prison “for his entire life” to quote again from the Mike Duggan letter to the Michigan Parole Board. There are many people who will be ready with denials when asked about their role in this scandal of one man’s lifetime. The current Detroit U.S. Attorney, Barbara McQuade and Paul Abbate, the outgoing Special Agent in Charge of the Detroit FBI had nothing to do with the federal government’s shabby treatment of Richard J. Wershe, Jr. in the past. But they are in charge now and McQuade and Abbate’s incoming replacement, Special Agent David Gelios, can take action now—or they can turn their back on the continuing civil rights injustice and disgraceful retaliation against one of their own informants. It looks to be an ongoing conspiracy to violate a man’s constitutional rights against cruel and unusual punishment that appears to be rooted in yet more public corruption. In part, this is the word of jail birds and ex-cons against people who are sworn to uphold the law. Yet, an investigation built largely on documents obtained under the Freedom of Information Act suggests it is the convicts who are telling the truth. After over a year of investigative reporting I can say with confidence the legend of White Boy Rick, the “drug lord” and “kingpin” is built mostly on lies. This is the real White Boy Rick story. It is a tale of shameful law enforcement exploitation of a kid. It is not about a kid drug baron. The kid was taught the drug trade by law enforcement. It is about depriving a man of his life because he helped the federal government prosecute people with political connections in a corrupt big city. It is a story the news media has consistently failed to grasp. So-called reporters and editors keep focusing on the victim—Rick—instead of the pile of lies concocted by some in the criminal justice community who are angry that Wershe told the FBI about the drug crimes and payoffs of some very powerful people. Today Prosecutor Worthy has a dilemma. If documentation and records suddenly appear on any of the issues in the Duggan letter, her office will have lied in an official response to a proper request made under a Michigan law—the Freedom of Information Act. If, as the prosecutor’s response to my FOIA request indicates, “no records exist” for the accusations that are the basis for the White Boy Rick legend, then there is no basis for claiming Richard J. Wershe, Jr. poses a danger to the community if he is released. Informant America has already established through a Freedom of Information Act inquiry reported in a previous blog post that Wershe has no disciplinary record in the Michigan Department of Corrections. An official at Oaks Correctional Facility, where Wershe is housed, says Wershe could be described as a model prisoner with no “tickets” for misbehavior. 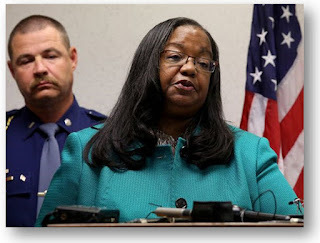 What’s more, Kym Worthy’s response to my request for the evidence behind Duggan’s letter to the Michigan Parole Board makes the Mayor of the City of Detroit look like a lying fool. Unless. Unless he didn’t write the letter. This is where the plot thickens. A spokesman for Mayor Duggan says the mayor simply doesn’t remember the letter to the parole board about Rick Wershe. Maybe that’s because he never wrote it. Let’s compare the Duggan signature on the 2003 letter to the Michigan Parole Board with the Duggan signature on a recent letter to Governor Rick Snyder. The signature above is the Duggan signature on the letter to the Parole Board. This is Mike Duggan’s signature on a recent letter to the Governor. Were the signatures written by the same person? You decide. Did someone in the Wayne County Prosecutor’s Office, someone with access to department stationery, forge Duggan’s signature to a letter he never wrote? 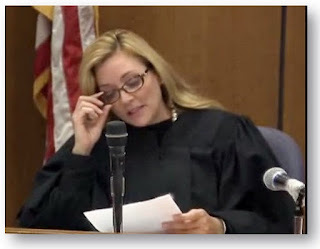 Is this letter the Michigan Attorney General has used as a court exhibit to persuade a federal judge that Richard J. Wershe, Jr. is an evil man and menace to society a falsified document? If Mike Duggan didn’t sign the fiery condemnation letter to the Michigan Parole Board urging them to keep Rick Wershe in prison until he dies, who did?